I've almost exclusively played my P Bass this past year, and I read articles about the differences between the P and J, including one of Fender's site. Basically the articles said that Jazz Basses lack the bottom end of a Precision. So having left my Jazz to collect dust, I started internalizing those articles. Sunday, I took it to practice. What a bunch of bull I'd bought into. It has a rich and full and deep bass. It is different from the Precision, but it's in no way lesser, just wonderfully different. I love the J neck width too. So I've re-found my love for the Jazz. I have that exact same bass and it is my #1 out of 12 basses. Have you ever tried wiring the pickups in 'series'? Sounds great, like a beefier Jazz...somewhere between J & P.
That's a good idea, but I gotta tell you, the sound I got last weekend couldn't have been beefier. I can't wait until next practice this weekend. I really have re-discovered my love for J Basses. I even had gotten to the point of thinking of selling mine. Sheee-it, that would have been a tragedy! They are different animals, but from a playing standpoint I much prefer playing a J and I've found you can get close to a P with a little EQing and approach. Any time someone says a J can't get that fat thump, I point them to John Paul Jones's lines in, "Ramble On". The implication I here, sometimes, is that J can't hold down the low end, which is ridiculous. They sound very different to me, but I never analyzed why. Am I right in saying the P has more of a mid-scoop? I love both but have gotten used to playing a Jazz and Jaguar because of the narrow neck and feel of the body. I did install a P pickup on my Jazz though because the sound is really unbeatable for rock and go-go. Different tone then he does. I gusss variety is always a good thing in the bass world! I have five jazz basses, two straight split pickup Precisions, and two high quality parts P-J basses. I've also owned a '71 Jazz, and a '73 Precision. Both model Fenders produce plenty of low bass. The Jazz bass, has two characteristics the Precision does not. They have an upper midrange peak, and a little bit smoother low end, because the neck pickup on a J is closer to the neck, than the CENTER of the p-bass halves. I play both types of basses all the time. I do prefer the j's for the tonal vaiations. I like the p-basses for the neck size and low mid bump they're known for. Everything That Touches You- The Association- Joe Osborn. Everything he played on, too. Sunny- Bobby Hebb- bassist unknown. Anyone know who that was? Funny- I always thought it was a p-bass, until I put on a pair of high quality headphones. An individual player will sound unique, even on the same model bass as others play. It's all in your hands, the setup of the particular bass, string and amp choices, and your approach to the instrument. I love both as well for their variety and tonal/playing differences. They really do feel play and sound like different instruments, even when you can get in the ballpark sonically. On a J, I feel I can play effortlessly (within my own limitations, of course), but on a P, I'm forced to slow down and simplify a bit, which is also a good thing. The other myth I'd like to dispel is the notion that you can't slap on a P bass. I love the sound of a slapped P, and at times I wish my Js could nail that sound sometimes. Which brings me to another topic: the PJ combo. I know some guys love them, and I certainly do "in theory", but I've yet to find one that successfully gives you what you're thinking/hoping you're gonna get: A P AND a J. For some reason, they just never quite get the classic sounds you think you're gonna get (especially in PUP combo. A slapped J sounds way better than a PJ, IMO, with both PUPs on). 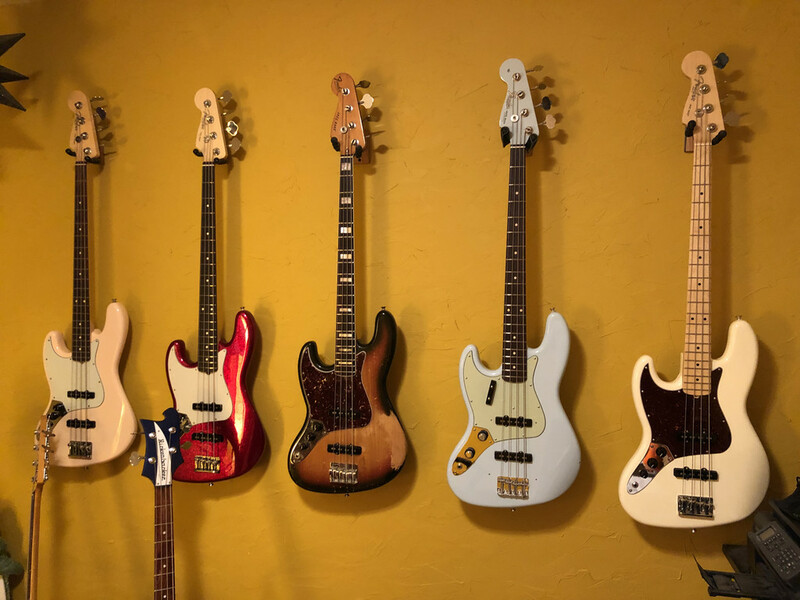 I have several PJ combo basses, and none really work for me. (That's not to say they aren't great sounding basses in their own right, just not a true P and J rolled into one). Maybe if the PUPs were swapped out for some more traditional voiced ones like some LInday Fralins, you might get closer, but it seems the ongoing challenge is finding a J PUP that can match the P in output yet still maintain the classic J sound. And the lack of the aforementioned JJ sound, especially when slapping, as I really don't like a slapped PJ sound. I think if the P PUP is reversed, it improves the PJ setup greatly too. I think a lot of it is what you're used to also. I loved a Japanese band called Go!Go!7188 and the bassist only played vintage non-reverse Thunderbirds. So that was the sound they created. But when they toured the US, she would leave the T-birds in Japan and rent P and J basses. The rest of the band complained how much worse it sounded. And indeed seeing them live, I would have to agree. You can't turn rutabagas into hippos. My opinion - for what it's worth - echoes what most of you are saying. They're both great, but preferences is preferences. I've tried endlessly to love jazz basses. Lots of my heroes played them. There are WAY more options available in JB's to us leftys than there are in PB's. But no matter how much I try, I just can't dial in a tone for the kinda rock and roll I need to play on a JB the way I can on a PB. Plus, I'm not a fan of the skinny JB necks and can never seem to get comfortable with where to put my left hand on a JB. Everything falls right into place with a PB for me. My band, over 20 years and 7 records, has been pretty diverse in it's palette. We range from boogie, to prog, to punk, to mild stoner tendencies. I settled in on PJ equipped basses a few years ago and like a previous post mentioned, couldn't get the balance between the pickups I wanted. Then I tried the EMG passive Geezer Butler P/Us (I know, I know, I've raved about these before...). These have WAY more balance and a great late sixties tone... but louder. If I want that PB thump I just turn off the J P/U completely. If I want more articulation, I run them both full out or just favour the P P/U slightly. If I want some tight growl, I will favour the J P/U slightly. I just ordered a new fancy P body from Warmoth with a PJ rout so I can rebuild my 8 string to have the same P/U config as my go to PB. I'll always have a Jazz bass or two in my collection. But they will never get the love from me that my P basses get. My hands and my style just don't make them sound nearly as good. And that ain't no myth. My band are headed to a recording session this weekend. I plan on taking the Precision. I love my Jazz now, but I need that P thump on this one. I'll use the J though next time we're live. I once thought that I was a Jazz Bass guy - the thinner, faster, neck, and famous growl. I also thought the Precision Bass was "lower" on the food chain than the J. I was wrong. I've wondered how they are. I've looked a few times online at the black P with the maple fretboard. The amount of basses people on this site have accumulated never ceases to amaze me! If you've lived in studio or 1 bedroom apartments for almost 20 years as I have, G.A.S. is simply not practical.